Go inside the secret lives of animals as never before as “Animals with Cameras,” the new three-part miniseries from Nature, uncovers truly unprecedented behavior. See what happens when animals become the cinematographers! Wildlife cameraman Gordon Buchanan and a team of pioneering animal behaviorists join forces to explore stories of animal lives “told” by the animals themselves. The cameras are built custom by camera design expert Chris Watts to fit on the animals unobtrusively and to be easily removed at a later point. See the footage they gathered — and explore a side of the animal kingdom where human cameramen can’t go. Swim with a seal, swing through the trees with a chimpanzee, and more! The groundbreaking “Animals with Cameras” airs Wednesdays beginning January 31, 2018. 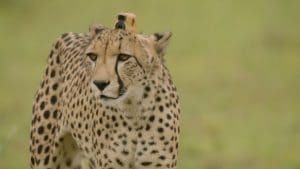 Part 1 – Airs Wednesday, January 31 at 8 p.m.
Part 2 – Airs Wednesday, February 7 at 8 p.m.
See how cheetahs learn to hunt, seals evade sharks, and farmers and baboons resolve a conflict. Part 3 – Airs Wednesday, February 14 at 8 p.m.
Deep-dive with Chilean devil rays, track brown bears’ diets, and follow dogs that protect sheep.